Passing thought the Urris area in 1993, while on holiday, Doris and her sister where talking about houses that they would like to own, her sister admired an old cottage, Doris wasn’t so taken, but as she passed a large two story property she said she would rather a house like this one, the house she was pointing to was the The Glen House. At the time Doris was looking for a house to retire too. She had been looking at Mexico, but mentioned to her good friend Stella that she would seriously consider retiring to the Inishowen area if she found a property from which she could see the sea, mountains and which also needed some renovation work done. Not long after that visit the Glen House came to the market and Stella informed Doris, who then decided to move lock stock and barrel to Inishowen and bought the Glen House in 1994. Born in Rockford Illinois Doris moved to New Jersey where she and her husband Tony ran a number of business over the years. He sadly passed away just prior to Doris visit in 1993. The Glen House was in need of a major refurbishment and Doris relished this challenge. Upon finishing her renovations Doris opened the doors to the Glen House to welcome Bed & Breakfast guests from all over the world. She was recommended by numerous travel writers including Allister Sawday and Georgina Campbell. 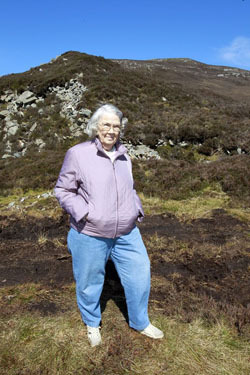 As well as carrying out extensive work to the Glen House, Doris also set about trying to develop the land leading to the Glenevin waterfall, by making the waterfall accessible for family. She saw it an opportunity to create a visitor attraction which would offer great tourist potential for the local area . This project is still continuing to develop year on year. With the addition of a National Loop Trail walk, picnic areas, gazebos and a car park. The Glenevin Waterfall Park now welcomes families coming to enjoying this area that has been created with support and involvement of the local community. Her work with the waterfall has been featured in countless media outlet, the most notable being Lesser Spotted Ulster, which to this day still is mentioned by visitor to the area. In 2012 RTEs Nationwide featured the work that was carried out by Doris and the local community in restoring the park to is former glory flowing a flood in 2012. Doris decided to sell the Glen House 2004 and this is when Martin and Sonia became the new owners.